An all-new action-adventure game, inspired by classic dungeon crawlers! Ring the good news bell! Blast the joy klaxon! Detonate the announcement Creeper! Got your attention? Oh, good! 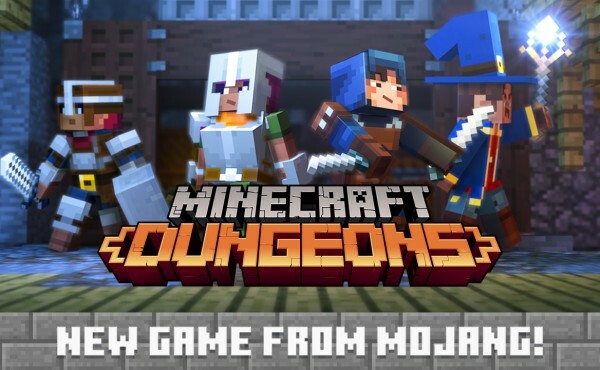 Because today, we"re introducing Minecraft: Dungeons - a brand new game from Mojang! Can you tell we"re excited? Well, it"s not every day we get to announce a new game! Minecraft: Dungeons is being created by a small and dedicated team in Stockholm, Sweden. This has been a passion project for them, and is inspired by their love of classic dungeon crawler games. But let"s get specific! What exactly is Minecraft: Dungeons? It"s an all-new action-adventure game inspired by classic dungeon crawlers, where you"ll constantly discover new weapons and items that will help you defeat a ruthless swarm of new-and-nasty mobs. You"ll fight or flee through canyons, swamps and - of course - mines! Minecraft Dungeons soll 2019 für PC erscheinen, Umsetzungen für PS4, Xbox One und Nintendo Switch sind zwar nicht konkret geplant, werden aber auch nicht ausgeschlossen. Back to Top Powered by CCDB v1.201 | Copyright © 1998 - 2019 CCDB - Statusbericht | Seitenaufbau: 1.0993 Sek. (PHP: 97% - SQL: 3%) | SQL-Queries: 27 | GZIP ist aktiviert.